Our members have become savvy at sifting through the alphabet soup of organizations and affiliates in the ABA – including ABE, ABI, FJE, ABF. 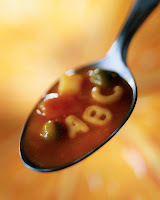 Post below if you know the full organizational names of ABE, ABI, FJE and ABF. For answers (although we are not encouraging peeking before you take a shot at answering! ), visit us here. 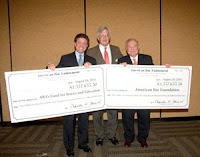 At the recent ABA Annual Meeting in San Francisco, we had the pleasure of presenting oversized checks representing our annual grants to the American Bar Foundation and the ABA Fund for Justice and Education. This year the total grants were more than $7 million. 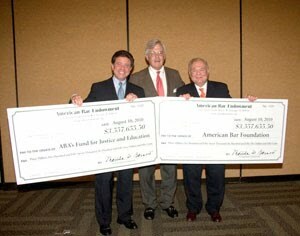 These donations help support over 200 public service, educational, and research projects in the field of law. We want to thank each of our insureds who donated their dividends to help make this happen. 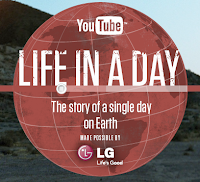 Google recently hosted an online contest to collect user-generated video of the average day of the average person on earth. All the uploaded content will be cut and edited into a full-length movie to debut at the 2011 Sundance Film Festival. This got me thinking. These everyday moments: walking the dog, commuting to and from work, taking the kids to school, laughing with family and friends, each of these moments make a contribution to the day. And, it’s moments like these that are better protected when you have adequate insurance for yourself and your family. With the right insurance plans for your needs, you are helping to protect your way of life. Tell us the little things that make up your days that are worth protecting! 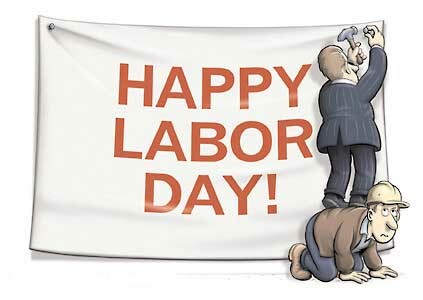 This Labor Day, we will give thanks for our ability to work to support our families and ourselves. ABA members know the value of hard work. And, you know the chances of becoming disabled are higher than any of us think. This Labor Day, take a moment to review your disability coverage which helps protect your greatest financial asset: your ability to earn an income. Call me to discuss your coverage and whether adding ABE-sponsored disability insurance can help protect you or supplement your existing insurance. It’s important to review your life insurance coverage on a regular basis to make sure you have adequate protection and September is a good time to do this. It’s Life Insurance Awareness Month, sponsored by the non-profit Life and Health Insurance Foundation for Education. For Life Insurance Awareness Month 2010 we’d like to ask you, what are your life’s wondrous moments? Watch the video above and then let us know what moments you are helping to protect for your loved ones by having life insurance.